Summary : I was pleasantly surprised by this tea. The flavor was pleasantly strong, yet the flavor was light and didn't have a "grassy flavor" to it. Definitely not your run of the mill cheap chinese restaurant green tea. Review : So, what to do at 5am? Well, it's too dark and cold outside to do anything. Hey, I know. Let's drink some tea. Maybe it will help me ward off the winter chill that seems to be permeating my place right now. So, now that I talked myself into some new tea, I looked around my samplers and the first one in easy reach was a green tea from Adagio Teas called Sencha Overture. 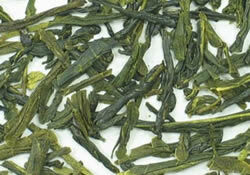 Here is how Adagio Teas explains this tea on their website : "Green tea from the Shizuoka region of Japan. Sencha translates as 'common,' but there is nothing ordinary about this exquisite 'spider leg' tea. The latter refers to the leaves' long, slender shape. Our 'Sencha Overture' is a wonderfully delicate second flush (summer) tea whose soothing taste and fresh green scent make it a perfect everyday treat." For those not familiar with Sencha green tea, it is from Japan. The term "sencha" refers to your "everyday" tea. And indeed, Sencha green tea is the most commonly consumed green tea in Japan. There are two primary types of Sencha green tea...Overture and Premier, with Overture being a step-down in quality, due mainly to lack of sediment found in Sencha Premiere. Now, for the flavored addicts of the world be forewarned...this tea is a pure green tea, as nothing has been added to it to give it a different flavor. I'll admit, I'm always a bit leery when trying a pure green tea, simply because I've had so many that simply taste like grass. True, those "grassy teas" have usually been from a cheap bagged tea, but sadly, that is NOT always the case. The flavor of this tea is surprisingly strong, yet, I didn't find the flavor totally overbearing. I'll admit, the strong flavor hit me a bit...I'm use to a more subtle flavor in a green tea unless something has been added to it. However, after the initial surprise worse off, I began to rather like the flavor punch this tea had. Moreover, this tea has two other fine characteristics that I always look for in a green tea. The tea has no bitterness. And the flavor of the tea does NOT taste like grass. Overall, this is a fine "everyday" green tea that is affordably priced. If you enjoy pure green teas, and don't mind a stronger flavor to your green tea, you should enjoy this tea quite a bit. Recommendation : Yes. This is a fine and flavorful Sencha green tea. It has a powerful flavor yet it goes down smooth and has no bitterness. I would NOT suggest this tea to someone who has never had a loose-leaf pure green tea before...I simply don't think it's the best tea for a newbies introduction to green tea due to the strong and distinct flavor. However, anyone who enjoys quality green tea should find this tea from Adagio Teas quite satisfactory.